[mp3] Bowerbirds: "Tuck the Darkness In"
The internet is a fickle place, and one of the biggest problems we have with blogs, is their extremely short memory and, at times, lack of faith in the long term careers of artists. Now - of course - this is a two way street. We'll care about bands that make second and third albums worth caring about. That rule is paramount. 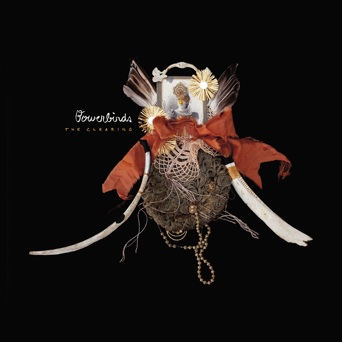 While we're no saints here when it comes to blogging - we think a band worth standing by for the long run is Bowerbirds. The duo of Beth Tacular and Phil Moore came to prominence on the back of a standout debut album, but have been quietly hibernating in North Carolina, nursing physical and relationship wounds, and walking dogs after tirelessly touring behind their second album Upper Air. As these things of course go, the band was busy recording their bigger and more adventurous third album, The Clearing, announced last week with a release date of March 6th via Dead Oceans. We're psyched to hear it, and we hope the rest of the press world is as well. The new song "Tuck the Darkness In" is very very lovely.